We hear so much about presidential candidates–and so little about life in the states that elect them. In “Beyond the Circus,” writers take us off the trail and give us glimpses of politically important places. Today, Charlotte. I was a high school senior the first time I saw a cigarette boat–those sleek aggressive vessels that can reach speeds of up to 100 miles an hour–on Lake Norman in North Carolina. Several of us were floating in the water off a friend’s dock and we could hear the boat before we saw it, the engines whining through the water and roaring above it. Back then, Lake Norman, created in the late ’50s and early ’60s when Duke Power built the Cowans Ford Dam on the Catawba River, about 20 miles north of Charlotte, was still a scruffy place of red clay and pine trees and muddy water, with A-frames or small cabins with screened-in porches on enormous lots. We were used to motorboats, pontoon boats, canoes (best for drinking beer in and then holding the empties underwater until they sank), sailboats (none too large), bass boats, and occasional jet skis (all of which seemed to be owned by doctors’ kids and which, to those doctors’ kids’ credit, they shared with the rest of us). But none of us had encountered in that habitat a boat whose sleek purpose was intense, deafening speed itself. The rumor, which I found credible, was that the cigarette boat’s owner was Larry Hedrick, the founder of the (very large) Statesville Auto Auction and a NASCAR team owner, and that he had two of them. This was the beginning of the 1990s, and I thought to myself: Man, here comes the neighborhood. A lot of money came pouring into Charlotte over the next couple of decades. The banking deregulations of the ’80s and ’90s removed (among many other constraints) the prohibitions against a bank from one state owning a bank from another state. This meant that Charlotte-based institutions like North Carolina National Bank and First Union, under their leaders Hugh McColl and Ed Crutchfield, would grow, consolidate, consume, change their names, grow some more, encounter crisis and accept bailouts, change their names again, etc. 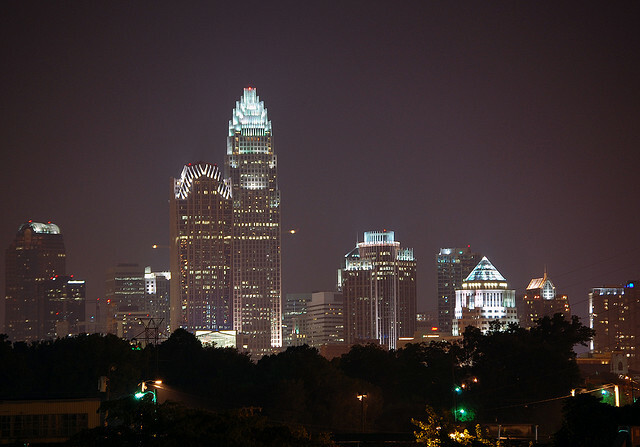 etc.–and become the headquarters of Bank of America and the East Coast headquarters of Wells-Fargo, thereby making Charlotte, as the visitor will repeatedly be reminded, the Nation’s-Second-Largest-Banking-Center. It is tempting to say here that banking has brought in the money, honey; and NASCAR is what people do with their time. But that would be incomplete. NASCAR, with the mechanical and infrastructure requirements of a major industry, is a massive and sophisticated business, expert at extracting branding cash from its partners, and it has brought in a lot of money of its own. Many lucky good ol’ boys are playing with their machines for what has become a very well-compensated living. The shores of Lake Norman now boast many of their homes, with their generic grandeur, precise lawns, and big toys. For a sense of this lifestyle and its pleasures, watch Will Ferrell’s Talladega Nights and just pretend it’s a documentary. And denizens of the area have leisure pursuits besides NASCAR. (Believe me when I tell you that some do not even follow NASCAR at all.) In the years since Larry Hedrick buzzed us at the dock, Charlotte has acquired: the mortifyingly terrible and anemically attended pro basketball Bobcats to replace the beloved Hornets (who themselves just got started at the end of the ’80s); a professional football team, the Panthers, who play in Bank of America Stadium (where President Obama is scheduled to accept his party’s nomination on the last night of the Democratic National Convention); an enormous downtown branch of the city’s art stalwart the Mint Museum; and plenty of new restaurants and bars willing to explain that they will “drizzle” some vinaigrette on your plate and eager to sell you and your hard-working work pals a Happy Hour bucket of Bud Light. There’s at least one good indie movie theater, which my parents drive for an hour from Statesville to visit. They go out to dinner afterward and make an evening of it. There have been many jobs lost in Charlotte and in the surrounding region since the crash of 2008, but the net jobs added over the past several decades still add up to a larger number. Civic accoutrements–the ball teams and their arenas, the expanded museums, the new buildings–are still standing. That said, any and every job lost hurts and frightens at least one worker and family, and rounds of layoffs in the thousands, large enough to be reported in the papers, are chastening for a city whose very proudly tracked growth was a product of its ability to outwit the fatal vulnerabilities of North Carolina’s historical economic mainstays: the “three T’s” of textiles, timber (by which is meant furniture), and tobacco. Two of these industries can and have been moved overseas. And the third, people can quit. Banking, especially large, aggressive, innovative banking, must have seemed impervious to these kinds of troubles. But that’s what bubbles feel like from the inside–lots of fun, sustained by the wisdom of those who are enjoying them, and bound to last. Until they don’t. Chapel Hill, another important North Carolina town, has several nicknames, one of which is “the pat of butter in the sea of grits.” I guess Charlotte could be called “the credit card stuck in a patch of red clay.” Or “the credit card stuck in a patch of red clay, with a splash of gasoline.” Charlotte is an aspirational place with a strong and observable feeling of pride, an acute consciousness of its own status, and a sense of humor about itself. It’s shaking off a hangover and finding itself. It’s a part of America. David R. Patterson is a literary agent. He grew up in Statesville, about an hour north of Charlotte. *Photo courtesy of Willamor Media.